By August, my front garden is past its floral (tongue firmly in cheek as I write this word) glory. 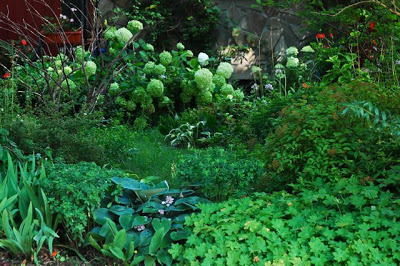 Spring is the bountiful season in this sandy, dry shade garden, and it all kind of slides downhill from there. Now the daylilies and Asiatic lilies are finished, leaving a few containers, some quiet hosta blooms and the hydrangeas to carry the load. Plus lots of leaves. This space evolved from scratch, however it has been a while since it’s had any real attention. On one hand, this shows it manages well on neglect. On the other, it’s long overdue for a good application of elbow grease. You can probably make out the framework of my dead burning bush (Euonymus alatus ‘Compacta’), for instance. When gardeners visit, as you are, I’m perversely compelled to point it out, like a kid who trips when people are watching and says: I meant to do that. I’ve kept this dead tree, pruned slightly for more, ahem, sculptural form, with every intention of painting it… if I could only decide on a colour. Till then… I meant to do that. Blooming more satisfactorily is the sweetly fragrant Hosta ‘Fried Green Bananas’. This large, chartreuse hosta is a sport of H. ‘Guacamole’ and has a white flower with a strong, jasmine fragrance. One of my first hostas as a beginning gardener was a highly fragrant H. ‘Honeybells’. Its intense perfume surprised me and, ever since, I’ve watched for fragrant cultivars. Another hosta, H. ‘Fragrant Blue,’ is not living up to its billing. 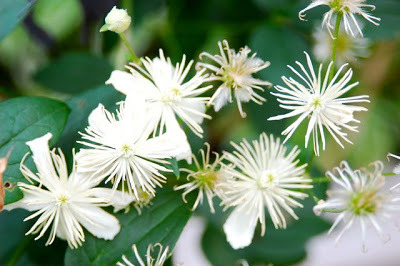 Still chugging along as it has been since June is Clematis fargesoides ‘Summer Snow.’ In late summer, it gives you a simultaneous display of buds, blooms and feathery seedheads. ‘Summer Snow’ is a workhorse in my garden. When I say workhorse, I’m not talking dainty pack pony; it’s Clydesdale or Percheron material in both size and vigor. Give it room. 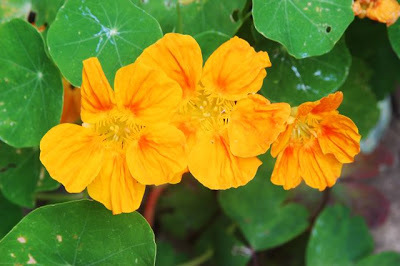 The weight of floral responsibility will now be carried by annuals, principally the ‘Paintbox’ nasturtium (Tropaeolum majus ‘Paintbox’) I tucked in as seeds last spring. My high hopes for a painterly blend of cherry reds, yellows and creams (driven by the package photo) was disappointed, as this batch seems to be almost entirely brilliant orange, with a few bicolours. (Next year, the variegated foliage of T. ‘Alaska’ might reappear instead.) ‘Paintbox’ is a climber, spilling over the paving in a Giverny-like fashion. 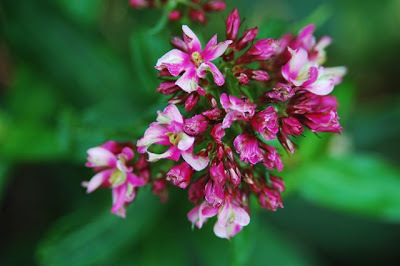 All parts of this plant are edible, and the flowers are peppery and pretty additions to salads. I like to pop one in my mouth as I pass, carefully inspecting it first (though aphids do add a modicum of protein). 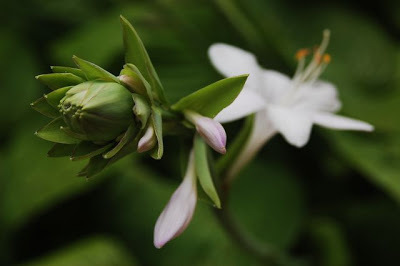 To see what’s blooming in mid-August in gardens around the world, visit May Dreams Gardens, where on the 15th of every month, Carol invites garden bloggers to share their experience. I love your lush shady front garden. What a lovely cooling sight on such a hot day. Beautiful! Your garden past its glory because the color is gone? Never, it is most lovely in its fullness and textures. Those hydrangea blooms sure stand out. I did not even notice the burning bush until you pointed it out. It will be cool painted. A nice cool color like blue or purple. Even red would work. Heck this is hard no wonder you can't select the color! Your garden is lovely. P.S. I leave the brugs in the ground with a big bag of compost on top of the rootball, but for a backup I take cuttings for wintering over in the house. These brugs are all from cuttings and were only planted this spring. Easy peasy way to have them. Helen, I love your posts. ('aphids to add a modicum of protein' hehe!) 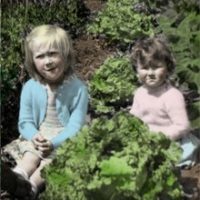 That your garden looks so lovely without, as you say, much 'elbow grease' means you have created something that lives in harmony with your land, and that's something to be proud of. Love the 'Fried Green Bananas' Hosta too! Helen, I have always wanted to have a painted tree in my garden after seeing Andrew Lawsons garden. It was a few years ago and his was painted bright blue, it was the first time I saw anyone do it. It was amazing! Nose Candy. No, not that kind.